The latest treatment protocols, combined with modern technologies allow minimally invasive implant therapy for the patient with shorter treatment times. The advantages offered by these new treatment methods are certainly accentuated in the treatment of the totally edentulous patient who suffers from aesthetic, functional, nutritional and psychosocial problems. The elements that revolutionized the old treatment protocols were: immediate loading, guided surgery and conscious sedation. 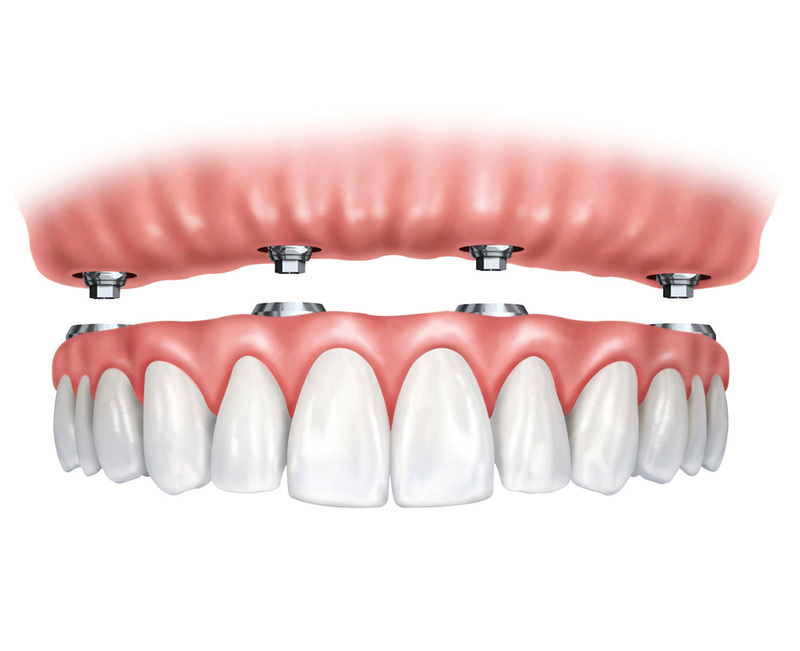 Immediate loading means there is the posibility to immediately use implants to support a temporary prosthesis without waiting for the traditional 4/6 months from the time of their installation. This means that patients wearing removable dentures can immediately replace the dentures with a fixed type prosthesis, and patients not wearing removable dentures, who need a complete remake, may also immediately have a fixed prosthesis. This procedure is feasible in many clinical situations according to the quantity and quality of the remaining bone. Guided surgery is certainly the most significant new feature that has affected implantology in recent years. This tool allows a virtual design of the implant treatment, precisely evaluating the bone anatomy of the patient in relation to individual rs prosthetic parameters. This is therefore in first place a diagnostic tool of great importance to favour safety for the patient and proper planning. Once the stage of study and planning is finished, a surgical template allows the operator to place the implants in the patient’s mouth, in accordance to the project already predetermined with the computer, and finally the provisory fixed prosthesis, which is also built before the operational phase. If the bone anatomy allows, the implant installation can occur without the cutting of a surgical flap therefore at the conclusion of therapy even the stitches are not necessary. Conscious sedation is an anesthetic technique that provides for the monitoring of the patient’s psycho-emotional component, thereby reducing anxiety and all its cardiovascular consequences. It is practiced by an Anesthesiologist and has the advantage of relaxing and monitoring the patient during the procedure. For endo venous-routes, the patient is administered small amounts of anti-anxiety drugs that do not alter the state of consciousness but lessens the effects of tension. You obtain a stabilization of rested blood pressure values and eliminate those hassles that often present like excess salivation, vomiting, and difficulty in maintaining the position required by the dentist. The patient is monitored for greater safety during surgery. Even all post-operative complications such as pain and swelling are almost canceled. Despite the patient leaving the center and feeling completely well, they should not drive bikes, motorcycles and cars for the first 4 hours after surgery. This protocol is particularly effective in treating PHOBIC PATIENTS or PATIENTS WITH CHRONIC DISEASES, as the complete monitoring of the patient during the procedure and the possibility to administer intravenous drugs, in case of necessity, allow to promptly intercept and manage any complications. The enormous advantages of this anesthetic approach, prompted us to extend this method of working to patients who are in good health and not phobic, but candidates for invasive surgical therapies and/or long-term ones. In doing so the patient has better comfort operative and post-operative.